Discussion in 'Standup Technique' started by shs101, May 14, 2014. The fight is only a few weeks away of an intriguing match up Cotto vs Martinez. I feel I've seen more talk of the tactical side of Cotto on here (in general) than Martinez. What do yous think of Sergio as a fighter and his style? What makes him so effective? Its always hard to fight movers who hit hard. Technically he wont wow you but he has a style that works well. Hard fighter to fight, has such an unorthodox style. Cotto wins.. sergio isn't who he used to be esp with the style he uses; the past few years he is coming into fights off injury or coming out of fights injured, an having huge layoffs.. rehab. Sergio is bigger probably the bigger hitter..better hand/footspeed; but he has problems with guys who can box..guys with high iq, guys like that have highlighted holes in sergio game. He did win...but had a lot of difficulties with both guys...pulling away late.. I think cotto jab..bodywork and footwork cause sergio a lot of problems; most guys he faced didn't have those things they had size durability youth strength power, but these dudes couldn't box..not like cotto can. Sergio's lateral movement and left hand should keep Cotto at bay. Plus it'll be harder to land Cottos left hook due to the stances (unless he's Andre Ward). Cotto is actually physically a bigger guy than Sergio, just hasn't fought at the heavier weight classes that Sergio has. I don't think Sergio is a bigger puncher either, he's just good at catching guys with shots they don't see....... but Cotto IMO is a heavier puncher. Sergio's definitely got the quicks, but he's no quicker than many of the lighter guys Cotto's been in there with (i.e Pac, PBF) and Cotto's been able to keep in front of them.... I don't think Sergio's speed or power is going to be anything Cotto isn't ready for or hasn't seen before. That said, Sergio's been in the ring with just as many, if not more tough, top level competitors. He just fights in a weight class that doesn't have the "attention" that the 40 to 54pd does. Nonetheless, he may not of fought the big names that Cotto did..... but he fought and beat the best out there and he's not been fighting easy fights by any stretch of the imagination. Cotto's strengths...... the opposite would apply to Canelo. Sergio's got hit cleaner, harder and more consistently by left hooks than any other single punch. The last couple times he's really been in trouble were because of left hooks. His lateral movement and left hand are offensively his best weapons, but they are also defensively his greatest liabilities. Yeah, I know, I saw that pic...... I've seen Oprah look skinny too....... 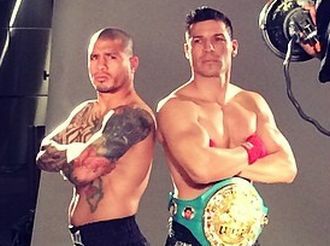 I know Sergio is taller, But Cotto is still IMO a more physically imposing fighter than Sergio. Sergio has faced tough experienced world class guys...macklin chavez williams murray bunema pavlik; most those guys tried to impose their power...their will...size strength on him. None of those guys could box him or tried to...they all felt he was too small and they could use size physicality to beat him most guys said this..
Cotto cn be physical with sergio and he can box him or he can go fifty/fifty; those other guys had one way to fight..one way to in...cotto has a few ways to in. Sergio has speed and mobility; but as u said cotto has seen that floyd paulie trout zab shane, more importantly all these guys can box ..something sergio isn't the best at either. Cotto has faced better guys..more experienced guys...more accomplished and physically gifted guys; i think cotto is in a better spot physically, has been more active, and fought the better opposition recently.